The question driving this congregation was, “How can we best have an impact beyond our own congregation and community?” They initially felt the environmental problems were so pressing that it was easy to feel discouraged. To keep up their spirits throughout the process of “walking the talk” on carbon reduction, they supported one another with a practice called “Active Hope”. This practice helps one to clearly identify a problem, the hope for a solution, and one’s active steps in the direction of the solution. With money tight, they came up with an ingenious plan to join forces with five other congregations, and coordinated by the Hoosier IPL, jointly apply for a state grant for which they pledged to cut energy used in all buildings by at least 25%, not counting solar panels, to have at least 1/3 of their membership cut their home energy use by 1/7 at home, and to then share what they learned with other congregations. They received the grant which their church was able to triple thru matching contributions from members, enough for the solar project and then some. 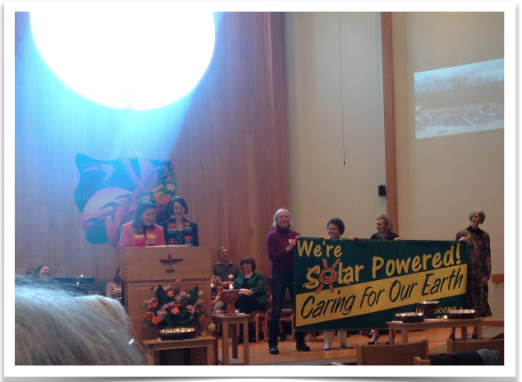 Between energy conservation, efficiency and renewable energy, Unitarian Universalist Church of Bloomington reduced its GHG emissions by 50% between 2010 and 2013 (from 62 tons in 2010 to 31 tons in 2013). In addition, in 2013 and 2014, together with Hoosier IPL they gave thirteen energy workshops to diverse congregations across Indiana with two other congregations that had received the grant.